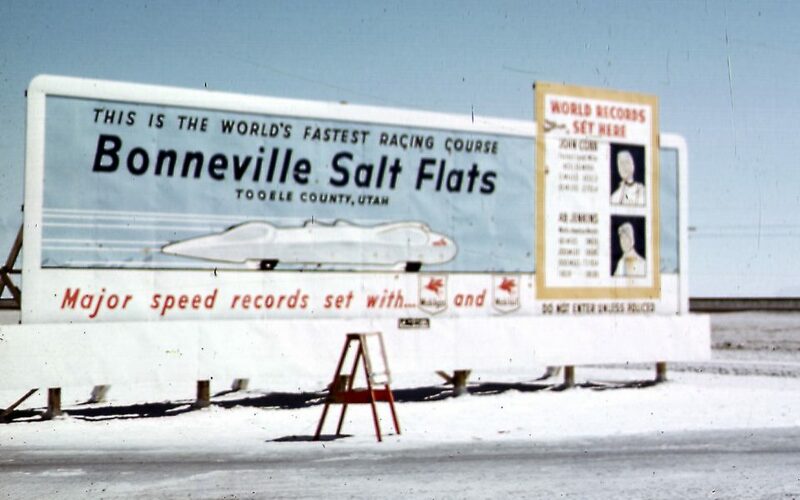 Jinx Vesco, wife and Team Vseco “Glue,” has been traveling out to the Bonneville Salt Flats for decades. Recently, on a trip out to “Lands End” where the service road drops visitors onto the salt beds, she was appalled by the condition of the informational sign. 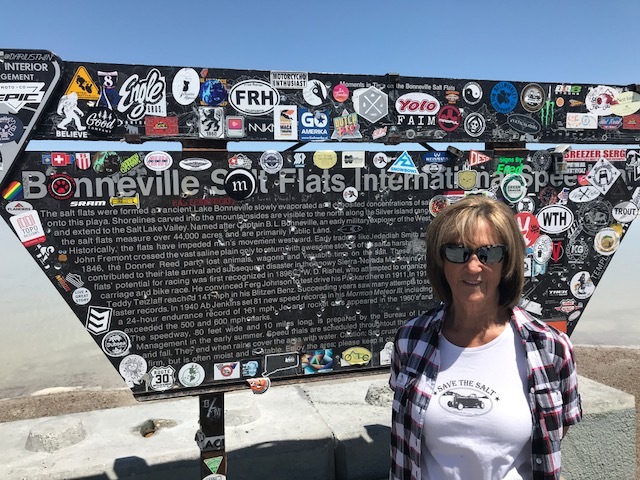 Knowing full well the Bureau of Land Management collects a great amount of annual fees from the land speed racing community , she believes that the signs at the location ought be well above eyesore status. As a concerned citizen, she filed a complaint with Matthew Preston District Manager of West Desert. She shared the exchange with Save the Salt. See below. Visitors to the Bonneville Salts will be lucky if all they have to do is read around all the bullet holes, the sign is now normally plastered with stickers and always hard to read. I am a Utah resident and a concerned citizen. My husband and I recently took a little road trip out to the Bonneville Salt Flats. At the end of the road was a film crew making a You Tube commercial. We were reminded of how many movies and commercials have been filmed out there over the years. 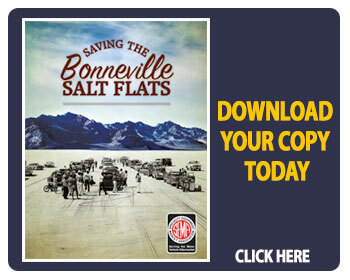 Indeed, the Bonneville Salt Flats are the only salt bed of its kind in the northern hemisphere and the race way that lies there is on the National Register of Historic Places. I grew up in San Diego on a dairy farm but my parents took us on many wonderful trips as we were growing up. I remember while traveling across the Utah west desert in the late 1950s my mother asking my dad to pull off the road to look at the flats. 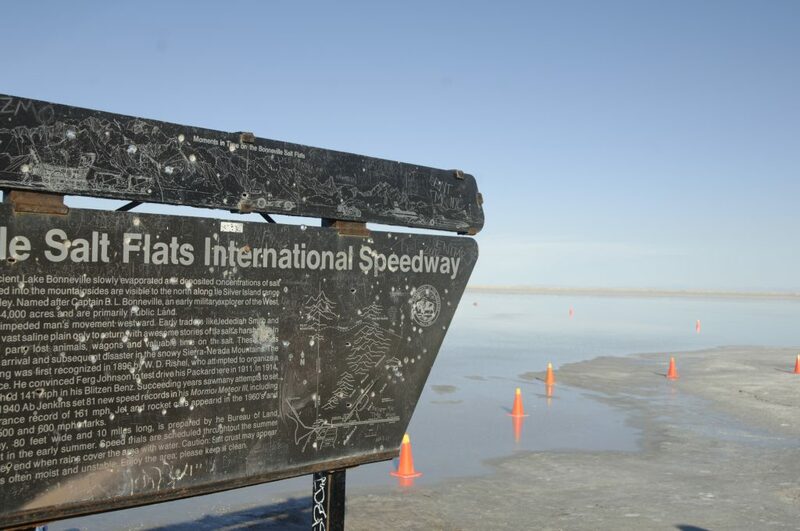 She read the sign to us (see attachment) and explained this was where the “fastest cars in the world” raced. My brothers and I were very impressed! Little did I know, at that time that I would eventually marry into the legendary Vesco racing family and that I would spend many decades on those very flats during racing season. My late brother in law, Don Vesco still holds the fastest World’s record for an automobile set in 2001. He was able to do so due the 2 previous years of intensified pumping of salt brine back onto the track which improved the length and quality of the race track. His record stands today because the track has deteriorated to such a degree that the high speed cars that require a longer track are now going to Australia and Bolivia to achieve their high speed goals. What a shame! Sadly, under the BLM’s stewardship things have gone downhill to an embarrassing degree. I understand that the West Desert is a huge area to manage. We have spent a lot of time “jeeping” out there. 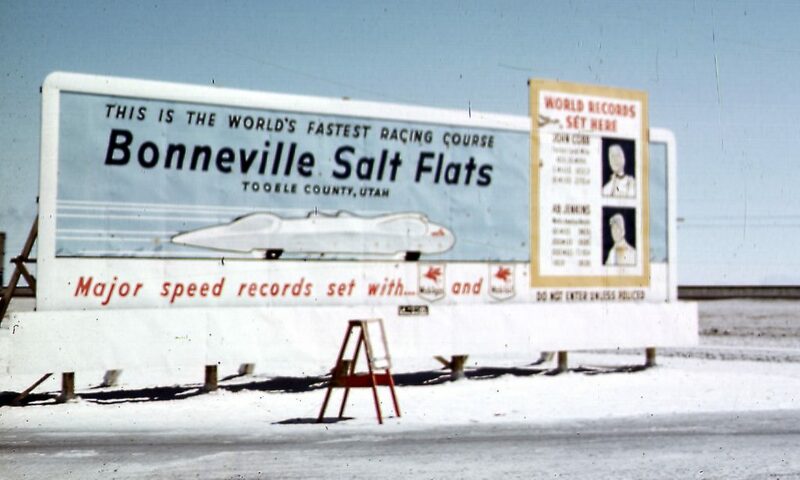 But I don’t think there is anything out there that draws tourists from all over the world like the Bonneville Salt Flats raceway. It is not uncommon to park at the end of the pavement and meet people from France, Germany, Japan etc. So when they come to see this famous place, they are greeted with this pitiful and broken sign. I did see the newer sign out there, but it is generic in nature. I would like to think that our country can do better than this. Thanks for the message and the pictures, Jinx. Appreciate you taking the time to write and share the images. At least once a year, and sometimes more frequently, we clean that metal sign of all the stickers. Roxanne Tea, our recreation specialists for the salt flats, has to actually use a blow torch to get all those stickers off. I’d love if we could do it more frequently, but the stickers accumulate so quickly! We’ll see what we can do to get it cleaned off a bit more frequently. Thank you for responding. Cleaning the sign is not the answer, it is also broken! Did you see my photo of the huge bill board type sign from the 1950s & 60s? This place, the BSF, has been called one of the Wonders of the World! Surely its the most unique place of its kind in the U.S! It has a tremendous history as well, including the early railroad etc. Why not make a spectacular sign? 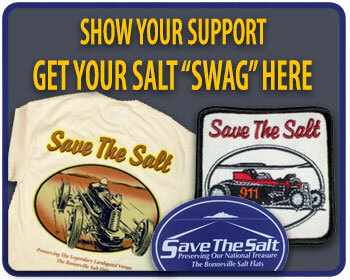 Why not partner with the State of Utah and the town of Wendover to come up with something truly grand? I appreciate your efforts and those of Ms. Tea but removing stickers is not enough! I couldn’t tell in the photo that the sign was broken – thanks for clarifying. We’ll see what we can do about that. I appreciate you urging us to think big. I like where you are going. I enjoyed looking at the historic sign. I’d never seen that one before, so I started asking around the office about it. Do you know what became of it? We’ll reach out to the State’s Tourism Office. Maybe they’d be interested in a big sign partnership.